As the title of this thread this little guide/tutorial will try to address how to install and configure Foobar media player's most important audio related features such as output modes and relevant codec plugins. I will only focus on the basic audio related features beacuse the list of available plugins is quite long , will require a very long time to write in an easy to understand way and even longer to “digest”, besides, many of them are for improving its looks or adding convenience features but have no influence on sound. Before installing anything, first download the player and desired plugins into the same easy to locate folder, it makes installation and setup easier and quicker. WARNING: The plugins come in with either .zip or .fb2k (also a zip) file extension, DO NOT extract the content to the component folder, that method is not recommended and can cause problems. Foobar extracts the contents automatically and places them in the correct folder/s if you follow the instructions bellow (Chapter #2). At this moment the most recent version of the player is 1.2.8 stable. Now using latest & greatest libFLAC 1.3.0. Fixed WAV tag writer potentially creating files of odd byte count (non-standard-compliant). Improved handling of various malformed AIFF file cases. Made WavPack files with malformed channel mask info play (final). New “Downmix channels to stereo” DSP replacing old “Downmix 5.1 to stereo”; now capable of downmixing various channel configurations (final). - Support for streaming to arbitrary UPnP MediaRenderer devices through the new UPnP output component. - Extended playback thread priority options in Advanced Preferences. - New: Converter “Quick Convert” dialog, for simplified casual conversions without advanced features. - New: Menu commands to switch between playback output devices. - New: Component installer now shows component licenses when available. - Equalizer is now an open-source component, separate from the standard DSP array. - Converter works on non-seekable sources again, such as Internet streams. - Fixed rare crash bug with “full file buffering”. - Improved media library relative path handling in portable installs. - Ctrl+A now works in generic text popup dialogs (popup_message API). - Crash reporting improvements for hopefully more meaningful data about deadlocks. - Updated zlib to 1.2.7. - Worked around playback/output preferences crash on Windows 2003. - Non-compliant ID3v2.3 TYER allowed by default since various other popular software does it. - Option to write “rating” as TXXX for the few people who want it. - Fixed properties dialog field copy/paste inconsistency when copying specific fields from single to multiple files. - ReplayGain scanner: added additional warnings when trying to scan a very large group of tracks as a single album. - ReplayGain scanner: addressed extreme memory usage when scanning a large group of tracks as a single album. - Cleaned up embedded cuesheet handling code. - Faster FLAC tag updates when full file rewrite is necessary. - Sanitized FLAC tag updating behaviors in low-memory conditions. - The File Operations component now be used to create links to files, in addition to copying/renaming/moving (beta 2). - Improved album art loading performance with huge libraries and complicated lookup patterns (beta 2). * Fixed phase inversion with 32-bit output. * New "high process priority" option for dodgy drivers that stutter under high CPU load. * Channel mapping configuration no longer required to use with popular soundcards - you can still configure alternate channel mappings if you need to. * Worked around all documented compatibility issues with various ASIO drivers. * Improved stability when dealing with buggy ASIO drivers. * Fixed playback getting stuck on audio stream format change. * Operates in two different modes, regular and event-driven - the latter seems to be more compatible with USB devices, but not supported by some other devices. * Separate process sandbox for improved stability. In case of drop-out or stutter, WASAPI buffer sizes can be adjusted in Preferences->Advanced->Playback->WASAPI separate values for Event and push mode are available. This plugin is capable to decode Super Audio CD ISO image content as well as DST, DSDIFF and DSD files. This plugin contains CODE FROM SACD Ripper code.google.com/p/sacd-ripper/ project. When needed adjust output volume and sample rate at File->Preferences->Tools->SACD. For direct DSD playback ASIO driver with DSD support is required. -"This postprocessing service component will decode HDCD data in any 16-bit PCM stream passed through it by supporting inputs, such as CDDA, WAV, FLAC, and WavPack. -"Adds decoding support for Monkey's Audio files (.APE) as well as APE Link files (.APL). Once the player and all plugins have been downloaded first step will be installing the player. The first option given in the installation process is installation type, standard or portable. If you plan to customize heavily Foobar and use it on more than one computer portable installation can be a good idea as it can be copied to a USB flash drive and shared across many PCs keeping the configuration (as long as hardware is compatible too). For use on a single computer choose standard. After that Foobar asks for the installation path and options (I recommend checking all). All installed components are shown inside the green rectangle. To add another click on install (red arrow #3). Point the window that pops up to the folder where all plugins have been previously downloaded choose any one and repeat WITHOUT clicking "Apply" or closing the player until all have been installed. Don't worry if just after installing a plugin it reads "Unknown" in the installed components list, they'll show their name and version once Foobar is re started. To acces all playback options click on the"+" sign by "Playback" on the left pane of preferences expanding it. In the second drop down list labeled "Processing" select "None"
For extra security 0dB can be selected in both the Preamp sliders. On the pic above you can see the default ones plus two I added, the DVD_A plugin and a SOX HQ upsampling plugin. The only one I use from time to time is the "Convert 5.1 to Stereo" because my Musiland is not so good at downmixing. DSPs are not installed here but as any other plugin, here they are just enabled/disabled and configured (when available). This section is key to get the best out of Foobar and your system. The image shows all available outputs to Foobar. In this example the laptop I'm using has two sound cards, the onboard Realtek (using Windows default "High Definition" drivers instead of the proper ones but that is a different story) and the Musiland 02. As each sound card has more than one out the list is quite long. As the Musiland also has SPDIF out the above is repeated but with replacing "Speakers" with SPDIF. For testing purposes ASIO4ALL is installed but only for the onboard sound chip. Follow the arrows in the same order to add a device. The ASIO Device Editor will show in the drop down list all ASIO drivers known to your O.S. (AKA Windows) be it only one or as many as ASIO compatible sound cards you have in your computer. Select one, click OK and configuration is over. Some Plugins create entries on the left pane where their options can be configured. Both DVD-A and SACD plugins do this, and in the SACD case, for example, you can choose its output format (PCM, DSD or Auto), PCM's sampling rate (24/88.2 or 24/176.4) and, if wanted, extra gain (0 to +6dB). Options are PCM or DSD. DO NOT use DSD if you don't have a DSD capable DAC, you might break something!. Compensates for the lower volume of most SACDs, Can be configured to any desired value from +0 to +6dB. Choose by personal preference unless you get distortion, recommended value is +0dB because it leaves more headroom but it may make DSD tracks sound quieter and can be annoying in a mixed PCM/DSD playlist. If only SACD ISOs or SACD-R is used, there is a replay gain database file that can be used to normalize volume levels. Options are 44100, 82000, 176400 and 352800Hz. Recommended value is at least 88200 but the higher the less processing involved (ie better) so try going as far as your soundcard/DAC allow. Solutions capable of 352.8KHz are starting to become available at affordable prices both as ready built commercial products or as DIY kits. - Multistage (Fixed-Point): supposedly the best one SQ wise but it is the heavyest CPU hitter, needs a fairly recent PC or may produce "scratching" noises by hitting too high CPU usage. - Direct (Floating-Point, 30KHz LF): The name says it so no extra description needed this one is also SSE optimized. Being 30KHz low pass filtered means all DSD noise above that frequency is removed and does not reach the amp. A very good balance between SQ and CPU usage. As the previous ones but using 64bit precission floating point instead of 32bit. Since version 0.6.0 two new modes have become available, these allow for custom filters in the DSD->PCM conversion. Some sample FIR filters with different Freq cut points are provided along with the plugin in the "Filters" folder inside the zip. Those with the required knowledge can write their own filters. 4) In the "ASIO driver" drop down list look for and select your DSD capable DAC. 5) From the options available in the "DSD Playback Method" choose the one that the manufacturer of your DAC recommends. You will need to take an additional step by installing ASIO4All (ASIO wrapper for KS) and telling foo_dsd_asio to use it as the output device. Needless to say that ASIO4All should be set up to use your DSD capable DAC as output device. If all is set up correctly, when playing DSD in Foobar ASIO4ALL should report 176400 Hz incomming sample rate (DSD64) or 352800Hz (DSD128). This is a new feature introduced in version 0.6.1 of the SACD plugin. It allows the user to convert PCM from WAV. FLAC, etc. to be converted to DSD as the music is played (the played file is NOT altered in any way) and sent to a DSD compatible DAC. All modern Sigma Delta DACs convert PCM to a format very similar to DSD before converting to analogue, this plugin lets the user do this process in software offering a choice of filters with a higher sampling rate (DSD128) instead of relying on the fixed algorithm present in the DAC. For those interested in playing from RAM here is a quick guide on where and what to modify to instruct Foobar to load the entire file to played in RAM and play it from there instead of the HDD so there will no disk access during play avoiding possible mechanical noise. When configuring the RAM buffer bear in mind total system memory, most modern PCs come at least with 3 or 4GB which should leave enough for a quite large buffer provided you are not running multiple apps when listening to music. Also, 32bit and 64bit have different requirements the later needing more RAM for system services and apps. 500,000KB (500MB) should be more than enough for an entire CD ripped to a single FLAC. If ripping to WAV the buffer may need to be increased to 800,000KB in order to make sure even the biggest file can be fully loaded. If all your music is in file per track format then 500,000KB should suffice for even 24/192 WAVs or DIFFs. Note that the value entered is the maximum Foobar will use only if needed, if file being played is smaller it will just use the equivalent to the file size + overhead + Foobar's own code. and in the SACD case, for example, you can choose its output format (PCM, DSD or Auto), PCM's sampling rate (24/88.2 or 24/176.4) and, if wanted, extra gain (0 to 6dB). Wouldn't it be nice if we could save the played file to a folder ? Oh well, one can dream ! It is possible to convert any track from the DSD ISO to any of the supported file types but I don't quite get the point of doing it bared lack of CPU power. Playing DSD and decoding to PCM in real time requires a powerful CPU. My laptop's T8100 dual core hits constant 80% usage when playing a DSD ISO so everything else has to be stopped or the will be pops and cuts, if you have a power lacking CPU it may make sense to extract to 24/88.2 WAV or FLAC. If you search other forums, you will find it is the Holy Grail for some people to convert from an SACD to .wav files etc. Presently many are using convoluted methods using a PS3 etc. that's just a superb easy to follow guide. is there any chance of having this guide as a sticky? Foobar is a well used piece of software and questions re it's set up have come up quite often. then it could be added to and updated. Fantastic post on setting foobar, nice and clear. have to say your in-depth Foobar tutorial is first class and adds another star to "The Grotto's" standing in my book. Until recently it as only possible to rip SACD to WAV but now it is possible to dump the DSD content "as is" to a ISO file. The ISO cannot be mounted in Windows using any software like Daemon Tools, Virtual Clone Drive, etc. as the OS won't recognize the format. 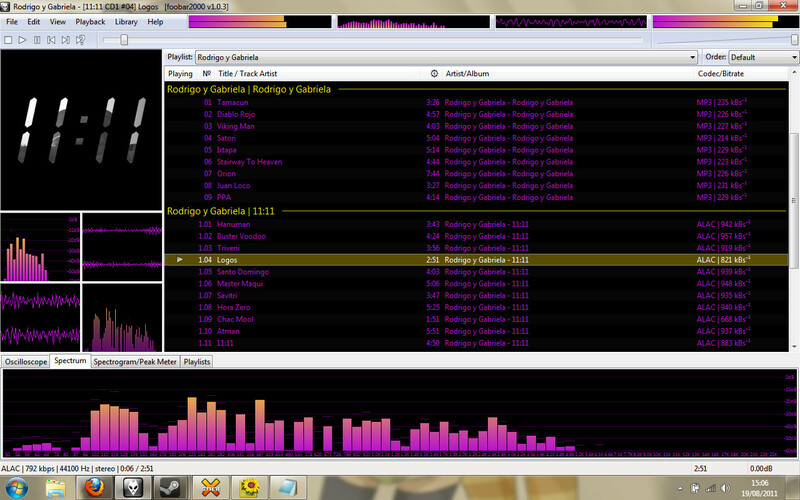 The only way to play it is using Foobar's plugin. You open it like a WAV file (is more convenient to associate the ISO extension to Foobar) and once loaded all tracks are shown, at that moment you can convert it like any other file. A normal DVD drive will not see the contents of an SACD. Other than using a PS3, how is it possible to create an .iso of the SACD ? Nope, you need one of the old "fat" PS3s and firmware has to be older than a certain version, else it is impossible. Most probably the price of such PS3s has sky rocketed in ebay since this was discovered. Forgive a know nothing numptie chipping in here but my Sony MM PC came with Sonic Stage Mastering Studio pre loaded. This allows me to play and record in DSD format. I bought the PC about 5 years ago bcause my local Sony Centre were selling them at a very good price when I happned to be looking for a MM PC . I have never really tried to use this programme but I am certain that I can rip DSD to .wav . Have either of you any knowledge or experience of Sonic Stage Mastering Studio? Are you sure it wasn't just a limited trial version ? First time I hear about that app Dave but it'll really, really surprise me if Sony included an app in its computers that would let you rip their "jewel of the crown" "ultra secure" format, at least not the comercial discs, maybe it will let you copy the home made ones. Nothing lost by trying though. 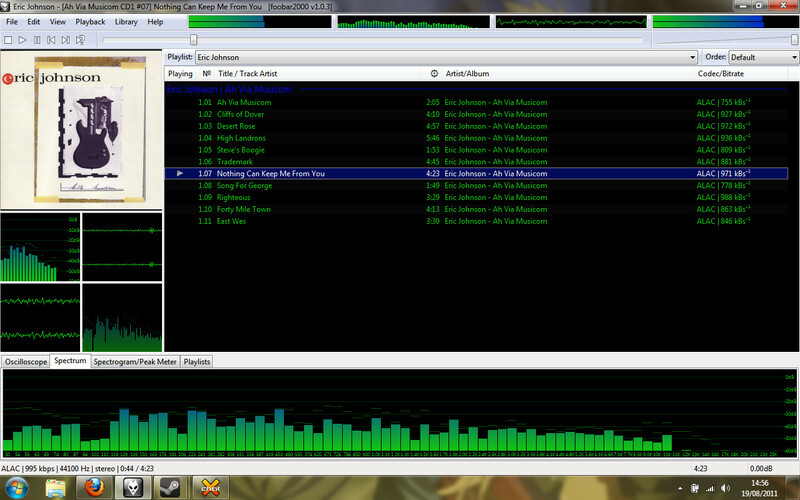 I love Foobar. Compared to iTunes it's so unbelievably configurable and has so many useful little options for playback and playlisting. And if you want to do something that's not a feature by default, you can either configure it yourself or find a plugin that does what you want. I also previously checked many reports of this software, and nowhere was mentioned it's ability to extract the contents of an SACD and convert them to other formats. Sony will NEVER give people the ability to rip it's SACD format discs. how do i change the visualization? I hear and understand you and greatly respect your expertise on audio matters, no question, but did you look at the link? The text in the RH column is nearly 'greyed/blued out' but if you click on it it becomes clearly legible. If you 'Google' Sonic Stage Mastering Studio quite a few links are given which tend to support that it does actually enable you to do exactly that, but if I'm reading it wrong feel free to correct me - you'll remain on my Christmas Card list . If your soundcard has full ASIO support, don't forget to try the more rudimentary "C Play". Through my highly modified MF-X-DAC V3 and Class A HA into the W1000 , it sounds WAY better than Foobar with difficult tracks like "Papa Doo Run Run - California Girls"
which sounds far more relaxing too.The difference in sound of the drums starting at 29.768 seconds is a revelation. I would love you to be right, but let's face it , Sony are highly unlikely to provide software to the general public that is capable of ripping their jealously guarded format at a high resolution . I await your results with interest. If you go to 'View' in the toolbar, then click 'layout' and 'enable layout editing mode' you will go into a mode where right-clicking areas will allow you to change and edit the layout and, say, change one visualisation to another. Or a playlist manager, or album art, or file info, etc. If you create a 'Scratchbox' (under Layout) you can freely experiment with the layout tools, with the option of saving that layout and using it if you so wish. Use splitters to divide sections. Like you, I couldn't decide on a single visualisation, so as you can see in my screenshots I put three sets on different tabs so I can pick whichever I feel like. so i decided to leave well alone. thanks for the advice and now i think i may tackle that with a bit more confidence. The layout I use is one of the pre-defined modes. I like them as simple as possible, just a little info on what is going. File --> Preferences --> Display --> Default User Interface and then on the right pane "import" under Theme Management, find the extracted file from zip, select it and click OK.